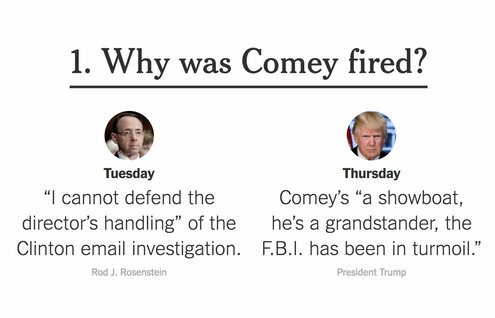 Here is a timeline of Mr. Comey’s short tenure as F.B.I. director under Mr. Trump. Mr. Comey met the president-elect for the first time in January 2017, during an intelligence briefing about Russian meddling in the election. In meetings and conversations afterward, Mr. Comey has said, the president tried in vain to secure his loyalty. 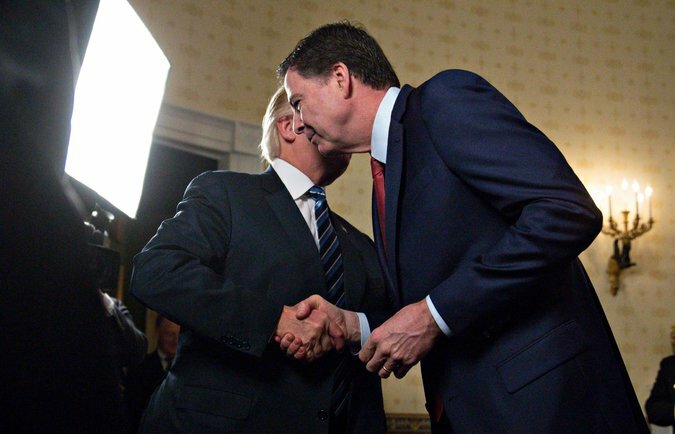 James Comey with President Trump at the White House in January 2017. Mr. Comey told a friend he had hoped Mr. Trump would not spot him at the event. In March 2017, Mr. Comey confirmed that the F.B.I. was investigating Russian links to the Trump campaign. He later said the president repeatedly asked him to say publicly what he had said privately: that Mr. Trump was not personally under investigation. On May 9, 2017, Mr. Trump fired Mr. Comey. By A.J. CHAVAR on Publish Date May 11, 2017. For Mr. Comey, getting fired was in some ways like being freed. He started tweeting under his own name in 2017. He shared quotes about leadership. He posted photos, often of nature and sometimes including himself, towering and pensive in bucolic landscapes. Mr. Trump grew bolder in criticizing Mr. Comey, calling him a “showboat,” a “nut job” and, more recently, an “untruthful slime ball.” The president’s stated reasons for firing the F.B.I. director have been inconsistent. In June, Mr. Comey discussed the president at length at a Senate Intelligence Committee hearing. It was quite an event. In testimony that was plain-spoken but forceful, he accused Mr. Trump of lying, defaming the F.B.I. and trying to derail an investigation. By THE ASSOCIATED PRESS on Publish Date June 8, 2017. Mr. Comey has now written a memoir, “A Higher Loyalty” Here is our review. It describes Mr. Trump as “unethical, and untethered to truth,” compares the president to a mafia boss and wonders about his reasons for refusing to acknowledge Russia’s attempts to meddle in the election. The book is set to be released on Tuesday.